How am I going to quilt this??? Maybe straight lines across and down....? I know Miri finished a lovely quilt. Marilyn and Sarah did too. going to get some quilt tops quilted!! I began this quilt with Victoria's 15 minutes. I still have some left!!!! I also used my vintage linen stash! How many 6" blocks did it take to make a twin size quilt? 65 square in a square blocks!!! I didn't even get to the magic twin size with that!! I was lazy and added a border. Now the quilt measures 65"x85". I think that's a respectable twin size. 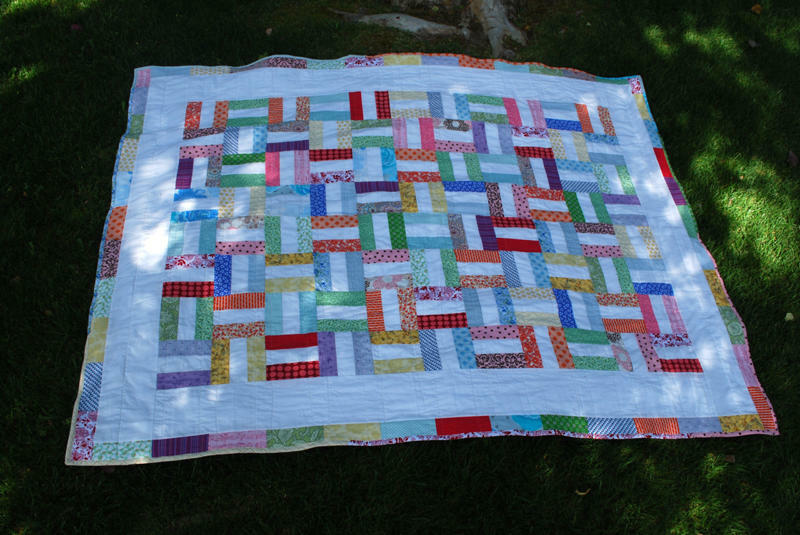 I like this scrappy quilt. and used some fabric in my stash for the border. was NOT very good in real life!! and also to the vintage sheet blog. They are giving away some lovely fabric over there!!! I was able to pick up a needle and thread only TWICE this past week. I worked on this mainly in the air on my way home. covered up! Even if these didn't fit perfectly snug. in one of my daughter's roommates. One for each of the girls in the apartment. This roommate also makes homemade bread!! I sure am missing out on that this year!! Can I go back in time and become a college student again?? And missed almost a week of blogging!! It was l-o-n-g week in blog time. I sure enjoyed the sights as I drove along, though. I didn't miss a single thing!!! was when I looked forward to stopping at shops like this one. When I walked in here, I instantly felt AT HOME. knows how to make a body feel welcome. "Maybe I'll be stopping at a WHOLE BUNCH of shops. I'd better save room in my bag for all the purchases...right?" solids are wonderful...don't you think? (with my husband's help via the internet) this shop in Oklahoma City. OOOh! I went a little wild here. Maybe it was the heat??! It was fun and I love all my little bundles. because it was SO unexpected!!! I saw a sign for the Tennessee Welcome center in Brownsville. That sounded like a good place to stop. WOW! What a welcome center. They even had a little museum inside. It was Great!! Guess what was taped inside the stall of the restroom?? A little flyer with some local businesses listed. I saw "Pat's Fabrics and Collectibles". Hmm...maybe that's a quilt shop??? I asked. Got directions. Viola!!! All Quilting books 50% off. There I go trying to get a bargain again! That was it for purchases this week. It almost didn't fit in my bag for the trip home! Here are a couple of the quilts that I just admired! I also liked this simple. wonderful. 9 patch!!! in a wonderful place called Bell Buckle. swing by this little tiny town and gawk at the antiques!!! especially when I had the friendly stops along the way! Aren't quilt shops the best of friends??? We know most of the fabric that lives there. and happy to be home safe with family. over to see Marilyn's striped beauty!! delivering a car to my daughter. Made for Dena at the modern quilting bee. The beginning of a fun project!!! I'm having fun as I go though! I was frustrated last night. Then I was frustrated this morning. and stitching my frustration out!! I used some flannel scraps. See those four yellow blocks in the middle? That's what I started with. I don't think it needs it...do you? I'll be showing it to it's new owner tomorrow. Find a nice backing fabric. should I piece some things together??? The wonderful things to think about when quilting. It fills my mind with happy thoughts!!! The back is nice and textured. a few lines around the words. They were very hard for me to eye-ball. I now have a name for these straight lines that aren't marked. I'm happy to be soooo close to the finish line. Just the binding now to finish off. I've got so many other quilts calling my name!! I'll add this to amy's sew and tell today. Friends came to sew today. Lori moved forward with her lovely 16 patches. I spent the morning ripping out. is to MARK staight lines!!!! but I did want them to meet up somewhat regularly at the edge!! Not an easy task when you're eyeballing it. and then I marked some lines. Why didn't I do that in the first place???? I'm lazy and hopeful...that's why. I hope I'm not so hopeful next time!!!! I'll forget my quilty troubles with a simple lunch. I wondered if these two would go together. I spread this on the roll before toasting. Lots and lots of turquoise and brown. Lots and lots of chain piecing. as I attempt to add a border with some applique. dragging my feet with the quilting part. I found a backing....that's one step closer, huh? In fact Sarah has her quilt top finished!! Amy's and Jewel's creative spaces. One more month of summer. One more month of a striped challenge. 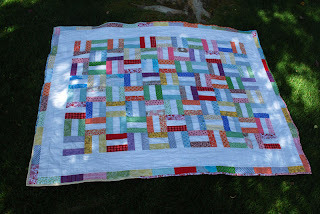 I might even have another striped quilt in me!!! I always seem to need to have another one started. a brown and Turquoise quilt someone requested recently. Ready to be sewn together.